SQUIDALICIOUS: Why Won't The Autism Society Rein In Jill Escher's Bigotry? Why Won't The Autism Society Rein In Jill Escher's Bigotry? I remain dismayed over how San Francisco Autism Society (SFASA) president Jill Escher comports herself in that role: She is openly contemptuous to many of the autistic people the Autism Society of America's (ASA) Guiding Princples direct her to serve, and misuses her leadership position at the SFASA to promote her personal opinions on, authorship, funding, and promotion of questionable autism science. And recently, she veered into outright bigotry at a talk at the International Meeting for Autism Research (IMFAR), which was then published on the SFASA site. Though I contacted Autism Society of America president Scott Badesch about my concerns last year, nothing but platitudes resulted. As Escher shows no signs of tempering her harmful approaches—and in fact responds to criticism of her actions with claims of being bullied or censored—I am now asking other people (i.e., you) to let Mr. Badesch (sbadesch@autism-society.org) know that Ms. Escher's actions are not acceptable, and that they reflect badly upon the Autism Society as a national organization. Claiming to be bullied by "neurodiversity advocates"
[image: White slide with black text reading, "How do we get there? How could UCSF, IMFAR, and the SFASA all allow something so offensive, with such overtly bigoted themes, to slide? I guess for the same reason that people usually don't stand up when they encounter bigotry in polite or professional society: It makes them uncomfortable, and confronting people is hard, and maybe someone else will do it. "Autism be just quirky peeps." This phrasing is either making light of African-American Vernacular English phrasing, or of people with speech difficulties. Neither one is acceptable. Coupling this phrase with Kool-Aid imagery—as associated with bigoted African American stereotypes as fried chicken and watermelons—is making matters worse two ways: implying that African American autism community members are less intelligent because they believe what mainstream scientists tell them about autism rates, and reinforcing why African American families too often feel unwelcome in the mostly white-dominated autism communities. I do realize Escher probably never considered that she was committing several racist fouls, but that doesn't mean her actions aren't racist. Racism is like traffic law; violations don't require intent. And I am going to say this right now: If she gets defensive about being accused of racism instead of apologizing for her missteps—even if they were due to thoughtlessness—that tells us even more about her lack of suitability for an unchecked leadership role. "...as Ms. Escher has described herself as a “science junkie,” she must be aware of the research indicating that autistic people have dramatically higher-than-non-autistic suicide rates. When an autism organization official who is supposed to be in service to the autistic population dismisses legitimately autistic people as merely “quirky” – when many of those autistic people’s lives never made sense until they received an autism diagnosis, and who don’t feel like they fit anywhere except in the autism communities – she is compounding the feelings of isolation, alienation, and depression that contribute to those elevated suicide rates." "The idea that increases in autism rates reflects changes in diagnostic definitions rather than a real change in the developmental condition's prevalence is not new. Other recent studies have found similarly that real rates of autism have not changed significantly over the past couple of decades, and a 2013 study found that identified autistic children "clustered" where resources for diagnosis and treatment were greater. In other words, where there's more access to diagnostic services, the autism rate is higher." Impatience with mainstream science is understandable; autism research is still not doing enough for autistic people and their families. But Ms. Escher's responsibility as SFASA president is to improve lives and resources, not to force-feed SFASA families her alternative autism facts. Besides, when it comes to people scoffing at mainstream science and then self-funding and promoting their own version of autism science reality, we need to be careful. Because you know who else used a combination of pay-to-play research and catastrophizing to strike terror into people's hearts about the autistic people who have always been here? Andrew Wakefield and his anti-vaxxer faithful. We don't need any more misdirections in autism science in general, and we certainly don't need it coming from one of the organizations that is supposed to be have our community's backs. I consider it horrifying that Ms. Escher continues to contribute to social alienation and fear of autistic people like my son and her own, most recently by compare autism to a "huge, gaping wound." Even Autism Speaks has abandoned such hyperbolic approaches. My own autistic son, like Escher's, currently requires 24/7 support, and may need that care for the rest of his life. But, even considering the uphill policy battle to ensure our sons have decent housing options as adults, those young men are more likely to get the care they deserve if others see them as human beings, rather than as society's burdens. 3. Claiming to Be Bullied by "Neurodiversity Advocates"
"One of the most troubling and counterproductive developments in the autism field over the past several years has been a growing virulence online aimed at suppressing and denigrating perspectives inconsistent with a particular neurodiversity view of autism. "The use of intimidation in lieu of mature and respectful discourse on critically important topics both polarizes and degrades our multi-faceted autism community. A culture of attack hurts autistic people as well as the many organizations striving to support them. "SFASA condemns bullying, and instead stands firm in defense of public discourse that explores and reveals the great many realities within the diverse universe we call autism. "Autism Society San Francisco Bay Area (SFASA) Executive Committee"
This statement is both absurd and hypocritical. Absurd because it is ... kind of the opposite of bullying when disenfranchised and historically discriminated-against groups speak out against those who try to keep them in their place and take away their rights. Women speak up when men try to belittle their concerns about or keep them out of women's health care discussions, and autistic people speak up when non-autistic people try to speak for them, while saying awful and misleading things about them. It's hypocritical because Ms. Escher is in the unfortunate habit of using that very SFASA site to lambast people she disagrees with. Ms. Escher claims it is her right to criticize evidence-based analyses of autism prevalence because she finds the author's assertions "absurd, dangerous and worthy of scorn" or when writing that a critic of the SFASA's alarmist analysis of California's autism prevalence rates is both "fantasies" and "engaging in flippant distortions to support ideological ends." Besides, when you install yourself as a public figure, you open yourself to criticism. Part of the media's job is to hold people in public positions accountable. And when someone who is supposed to be serving a community is actually going against that community's interests while trying to silence criticism from that community, that is a problem—as anyone who follows current U.S. politics understands only too well. Again, please write to Scott Badesch of the Autism Society of America, and to the SFASA itself, and let them know: They either own being associated with the ableist, racist, and pseudoscience material Ms. Escher publishes under the banner of Autism Society, or they install safeguards and editorial review processes to ensure the ASA Guiding Principles are not mere lip service. Autistic people and their families already have enough rampant negativity and stigma to deal with. We really don't need a parent from within our own autism community making matters worse. I understand being scared about our kids' futures. But I'm not throwing my son under the bus to get him what he needs and deserves, and I'm not going stand by while Ms. Escher tries to do it, either. 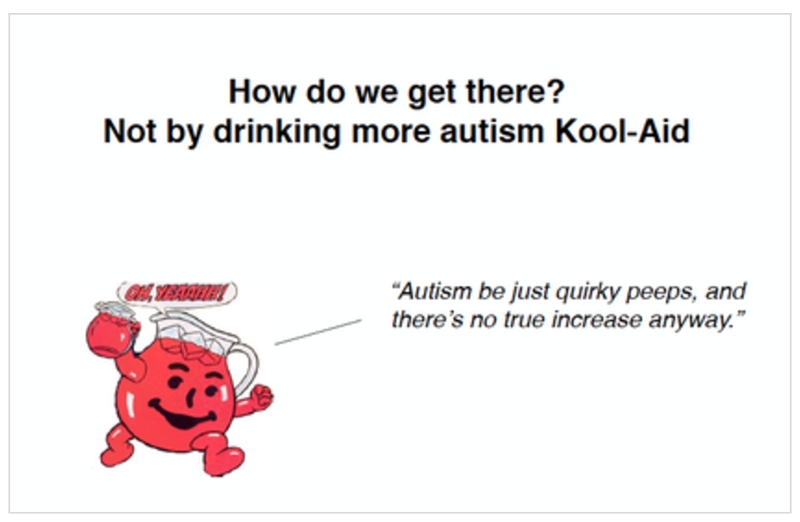 the Kool-Aid imagery was probably meant to give off the impression that the neurodiversity movement is a cult, the racism was just a (still inexcusable, and probably intentional) side effect. Yep, I allowed for that. The kool-aid image clearly references the Jim Jones cult and has nothing to do with the African-American community. The quotation represents the ignorant thoughts of those outside the Autism community, not the opinions of Escher, who is obviously using the graphic to belittle those naysayers. While the language used is unfortunately biased and the graphic is pretty tacky, you have misinterpreted the graphic as a whole and put a lot of effort behind something that doesn't require it. Probably time to move on to a new battle and let this one go. It may interest you to know that, of the people I checked in with before writing about the graphic, many of the non-POC people expressed sentiments similar to yours--but all the people of color confirmed the coded and dogwhistle racial elements. I think it's fishy she's parodying naysayers using AAVE. Or, if it's just a coincidence all these things are racist, she should APOLOGIZE and take the thing down.